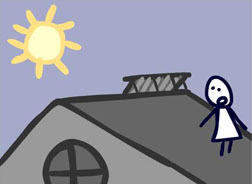 Click on the image to view a short animation about how evacuated tube solar collectors work. Solar thermal systems convert sunlight to heat that can be used for space heating, space cooling, and domestic hot water. The core of these systems is the solar collectors. 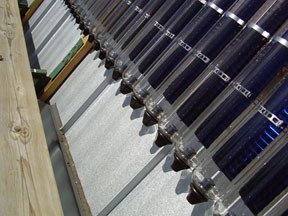 There are several different kinds of solar collectors, the most common of which are flat plate and evacuated tube. Solar collectors convert the sun’s energy most efficiently when the sun’s rays hit them at a ninety degree angle. In the United States, the sun is always in the southern part of the sky and is higher in the summer and lower in the winter. 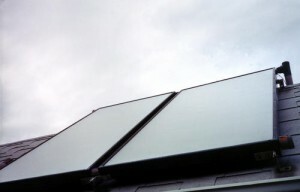 That means that solar collectors are most effective when they’re installed facing south and tilted towards the south. The degree of the tilt determines what part of the year the solar panels are optimized for: the greater the slant, the more the panels are optimized for production during the fall, spring, and winter when the sun is low in the sky. Evacuated tube collectors feature parallel rows of transparent glass tubes. Each tube contains a glass outer tube and a metal absorber tube attached to a fin. The fin’s coating absorbs solar energy but inhibits radiative heat loss. The tubes are manufactured with a vacuum between the outer and inner tubes, which eliminates conductive and convective heat loss and helps them achieve very high temperatures. The inner copper tube is filled with a non-toxic liquid. As the liquid absorbs heat from the copper pipe, it evaporates and rises to the top of the copper heat pipe. A larger portion of copper at the top of the heat pipe is the condenser. It either surrounds or is mounted inside a pipe through which a heat transfer fluid (generally water or antifreeze) flows. As the heat transfer fluid flows, the condenser loses heat to the fluid, and the gas inside the heat pipe condenses and flows back to the bottom of the heat pipe as a liquid. The heat transfer fluid is then pumped to a heat exchanger inside the building, where the heat is taken out of the transfer fluid and put in to the domestic water supply or heating system. Glazed flat-plate collectors are insulated and weatherproof boxes containing a dark absorber plate under one or more glass or plastic covers. Unglazed collectors, typically used for solar pool heating, have a dark absorber plate made of metal or polymer, without a cover or enclosure. This type of collector is by far the most common. With both types, small tubes run through the box and carry a fluid (either water or an antifreeze solution). As the sunlight hits the dark absorber plate, it heats up and transfers heat to the fluid passing through the tubes.